Walter, who acquired the nickname 'Chub' early on in his life, was the third of five children born to Anthony and Leona. He had four sisters, all of whom have passed away. On 26 Aug 1944 in the nearby town of McCartyville, he married Naomi Grilliot, daughter of Bernard O. Grilliot and Frances Drees. They have six children together, an Naomi also celebrated her 90th birthday this past December. Here are a few of photos from his 90th birthday celebration. His love of cake hasn't diminished with age! 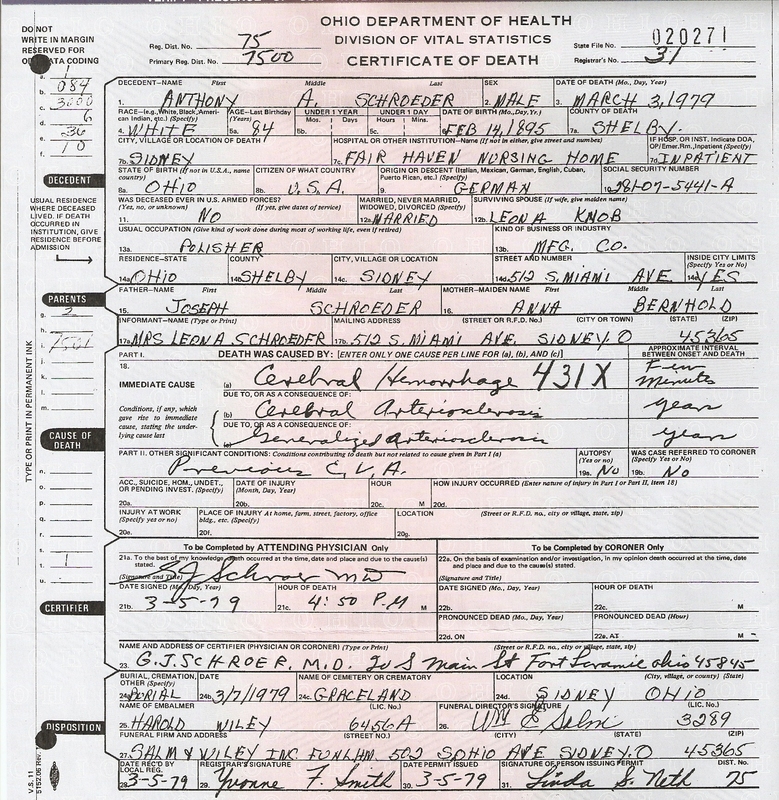 Walter's parents, Anthony and Leona, were both grandchildren of German immigrants who settled in western Ohio in the mid-19th century. To learn more about Walter's ancestors, click on the links below. 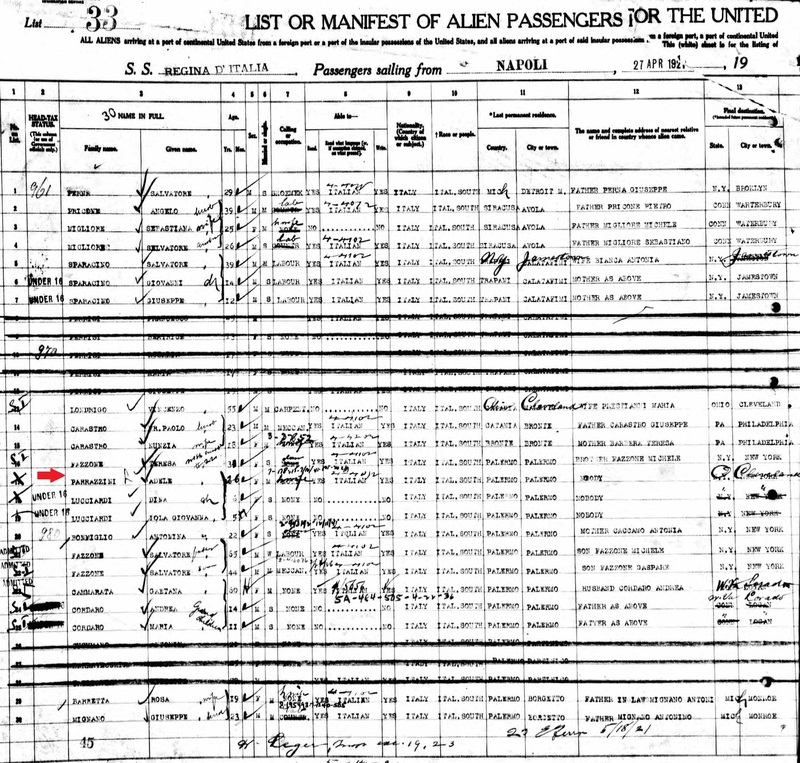 On this form, as well as on her ship manifest from 1921, her surname is listed as 'Parrazzini,' but her birth surname may actually be spelled 'Parazzini, as the former does not seem to be at all that common in Italy. Adele came to America in 1921 and passed away in 1990 at the age of 95. Adele married Luigi Licciardi in 1913 at the age of 18. (The petition lists her marriage date as 1919, which is incorrect.) Luigi was a Sicilian, and they met in the north when Luigi was on military duty with the Italian Army. So, my grandmother and her sister had the unusual combination of a northern AND southern Italian parent. I do not (yet) know the names of Adele's parents. They did not come to America and probably lived out their lives in Milano or in a nearby area. 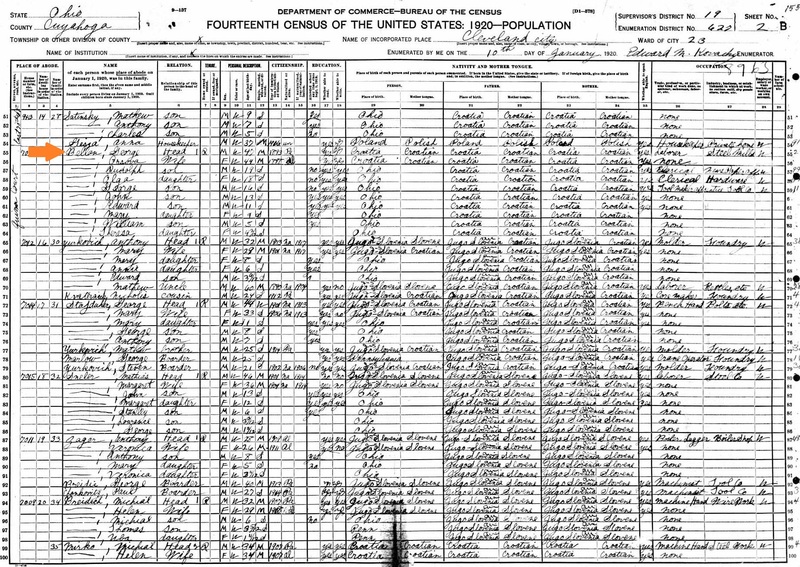 I couldn't let the day end without publishing something on my blog related to my maternal grandmother, Dina Licciardi Bellan. Today would have been her 100th birthday. She was born 4 September 1914 in Iselle, Italy, which is a small mountain town on the Italian-Swiss border. She immigrated to America with her parents and sister when she was about six years old. She served in the U.S. Coast Guard during WWII and married my grandfather, William Bellan, in 1947. They had two children. She was active in her church community and loved to cook and socialize. She passed away in 1997. Here is a photo of her with me as a baby, circa 1979. On this day in 1796, a Connecticut Land Company surveying team arrived near the mouth of the Cuyahoga River on the southern banks of Lake Erie and founded Cleveland, Ohio. The city was named for General Moses Cleaveland, who was the leader of the group. If you follow my blog, or know me personally, then you know that I was born and grew up in the suburbs of Cleveland. My working-class (i.e. 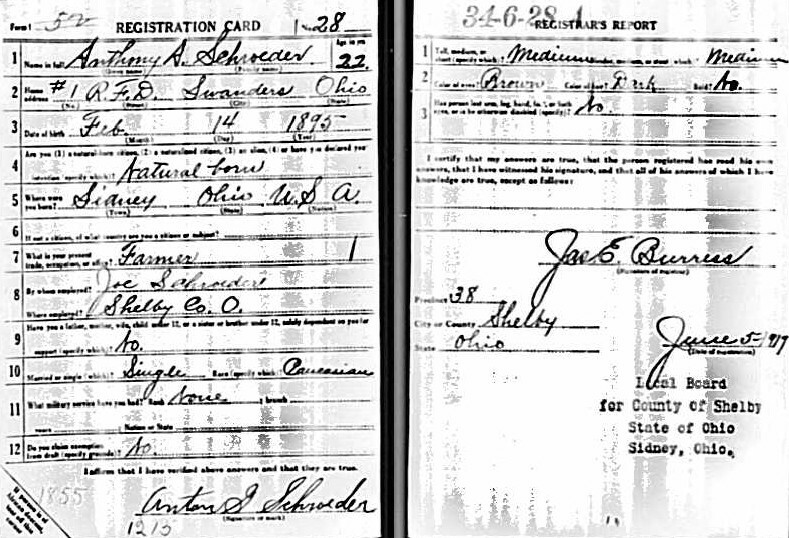 poor) great-grandparents emigrated from various parts of Europe between 1890 and 1920 and settled in Cleveland. ALL of my family's American history remains there, along with most of my close living relatives. I'm not there, and for someone who values family history so much, it's often hard to be away from the place I came from. Most people think fondly of the place in which they were raised, but Clevelanders have a unique pride that is truly difficult to explain to an outsider. Why do I personally take so much pride in a city? True, some of it has to do with ordinary nostalgia, but I've come to realize that most of my pride is far deeper than that. And it has been through my family history research that I have come to this realization: my family, along with hundreds of others like mine, literally built this city. My great-grandfathers sacrificed hours upon years of their lives in foundries and steel mills, creating the materials and tools that were building not just Cleveland, but cities and infrastructure all over America. 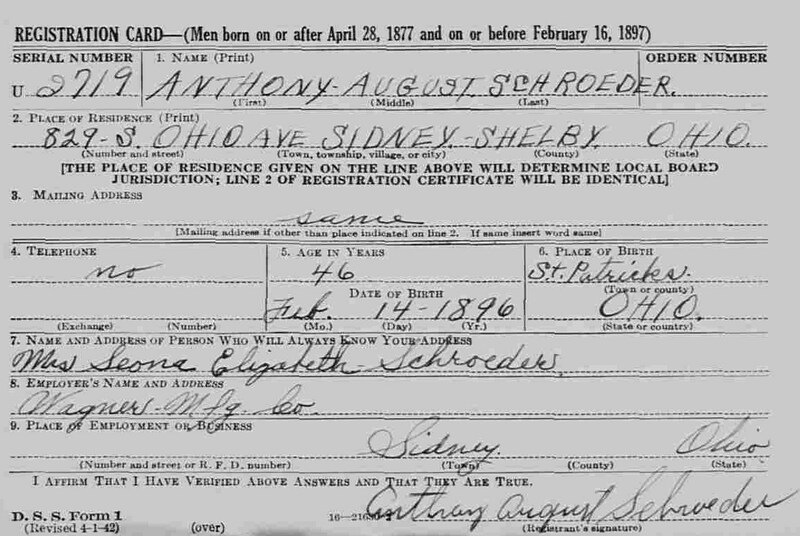 And maybe I've always known that my ancestors "worked in the mills," but actually seeing "Steel Mills" under the 'Industry' section of my great-grandfather's 1920 census form and "Ferro Machine Foundry" listed as employer on my other great-grandfather's WWI draft card - it makes my pride for my family AND my city grow exponentially. Cleveland saw an immense population growth during the 30-year span when my immigrant ancestors arrived; the population grew from about 260,000 to 796,000 between 1890 and 1920, when the city was the 5th largest in the U.S. Even though they didn't have a lot of money, my grandparents came of age in a thriving city full of growth and opportunity. By contrast, I grew up in a Cleveland that was constantly being joked about, a Cleveland that was losing jobs, losing people, losing hope. We took the jokes in stride, and when people teased us about our river catching on fire, we laughed it off, but inside we knew that that pollution, as horrible as it was, was our ancestors' livelihoods, and represented food on the tables and clothes on the backs of our working-class families. No, our sports teams never win anything, but, perhaps against better judgment, we never give up on them, and that is a quality that is in our blood. My ancestors never gave up, no matter what life threw at them. And if there is one thing in life I want my kids to learn, it is to never give up. 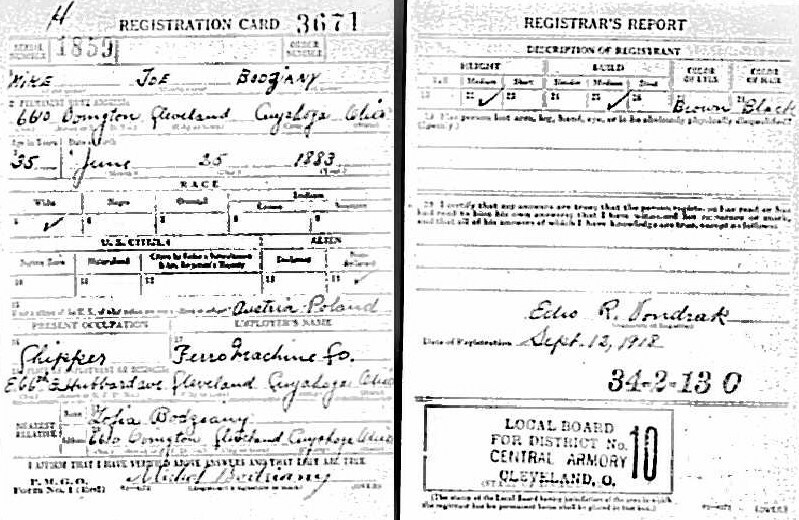 I've thought of what my great-grandparents and grandparents would think of the Cleveland of today. They would be proud, and they would recognize some of the economic and social growth and excitement that is going on there today. My great-grandparents came to Cleveland to reinvent themselves, to improve their lives, to build a city that is better for their children. That's exactly what Cleveland is doing today. The way to get to the bottom of this would be for me to find his baptismal record, if it exists. Babies at this time were usually baptized within a week of birth, so that would surely confirm whether or not the February or the March birth date is truly correct. Unfortunately, the archives for the Archdiocese of Cincinnati are currently closed, so there is little chance of me finding that record any time soon. Today, January 24, is singer Neil Diamond's 73rd birthday. Neil has had many hit songs throughout the years, but he may the only recording artist to make a hit out of a immigration-themed song. His 1981 song, America, is a powerful, positive song that more or less serves as a anthem to the people (our ancestors) who, for better or for worse, came to this nation to live, to work, and to make better lives for themselves and their descendants. I found a nicely done video on YouTube, in which the producer, Orpheus, uses the song and immigration photos, art, and postcards to compile a really nice tribute to American immigrants. Enjoy! Wordless Wednesday: Happy Birthday, Grandma Bellan! Dina Licciardi Bellan, born 4 Sep 1914 in Iselle, Italy. Shown here in Lake Worth, Florida, 1943. Today is the one year anniversary of my blog! (Feels like it's been longer, though!) I decided to create a family history blog during our 5+ hour drive to my family's house last year for the 4th of July holiday. I had recently started a website through Weebly, for the purpose of posting family photos and documents so that all of my family members could have access to them. I saw that Weebly allowed for blog creation as well, so I decided to give it a try. I am so glad that I did. Writing about photos and documents makes them come alive and helps to extract the stories hidden within them - stories about our relatives. Writing about my own memories of relatives who I have had the opportunity to know has been an emotional and fulfilling endeavor. And I have learned that I actually LIKE writing (Shhh, don't tell my 16 yr old math-and-science-oriented self who cringed every time I had to write a paper for school). Some people write family history blogs with the intentions of someday writing and publishing a book about their family; that's not in my plans right now. I enjoy sharing the stories of our ancestors and learning about the times and places in which they lived and worked. I enjoy writing about the genealogy research process, my research triumphs and dead ends. And I enjoy interacting with the other family history bloggers I have met through my blog and other social media. My blog has put me back into touch with cousins who I've lost touch with over the years and it has helped me 'meet' other cousins who I didn't even know were out there. Thank you to those of you who have read my blog posts.